Colic isn’t usually a ‘wait and see’ situation. Prompt attention and treatment are essential. A colic might be mild and pass on its own, but some colics are a symptom of a more serious problem that will need veterinary care. Here is how you can tackle most cases of colic. However, if your horse is in distress, perhaps rolling and thrashing, or visibly in pain, your first step should be to call your veterinarian. Assess the severity of the colic. If your horse has mild colic, perhaps looks uncomfortable, is biting at his flanks and stands stretched, watch and see if the colic abates after about 30 minutes time. Look for a lack of manure or signs of diarrhea, signs such as crushed bedding that indicates the horse may have been trying to roll in his stall, sweating, shaking or any other unusual behavior. Once you’ve determined the severity of the colic, remove all edibles (including bedding) from the stall. It is usually okay to leave water, although it’s unlikely a sick horse will drink anyway. As long as the horse is calm, you could try doing ‘belly lifts’ and hand walking or lunging. A few minutes of trotting may help, but only for a few minutes. Don’t tire him out. If he starts to feel better, offer a tiny bit of food. If he eats, he may be over his bout, but keep a close eye on him for several hours afterward. Your horse should be back to normal, including producing a reasonable amount of manure within a short time. Some colics can be cured by taking your horse for a trailer ride. Mild impaction colic or gassiness can be relieved by bouncing around a bit. The motion helps the horse produce manure and expel gas. For a mild colic, this might help. Again, it's important not to stress your horse, or tire it out. If mild colic symptoms haven’t abated after about a half hour’s time call your veterinarian. Write down any changes in feed, drugs or de-wormers administered, changes in routine, or anything else that you can remember that might have triggered the colic episode. Take note of the amount of manure he has produced and what the consistency of the manure is like. Is it runny, or very dry—anything out of the ordinary is important to take note of. This may make it easier to diagnose the cause of the colic and speed treatment. If your horse seems shaky, and but isn't rolling violently, drape him with warm blankets. Horses who roll in blankets have a chance of getting caught in the straps. A horse that rolls in its stall is in danger of getting cast against a wall. If the horse is thrashing violently look out for your own safety first. 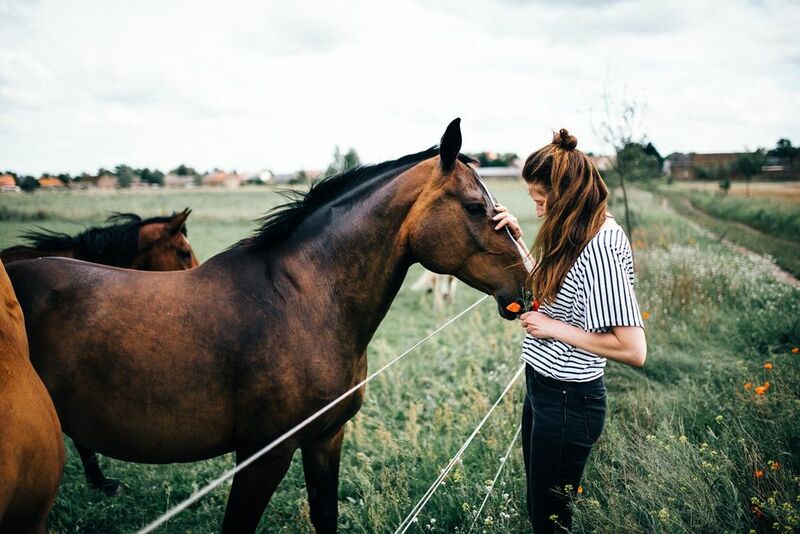 Your instincts will be to try to calm your horse, but a horse in extreme pain can be oblivious to everything—even a familiar and respected handler. Call the veterinarian immediately. It has long been thought that rolling and thrashing violently may cause a twisted gut. But whether this is true or not has not been established. Try to keep your horse on his feet. Traditional colic care included walking your horse, but if he is already tired from thrashing and rolling, walking may only add to his fatigue. Your horse will be okay standing, or just lying still for a short time. It may be nearly impossible (and dangerous) to stop a horse from rolling. If possible to do so safely, move him to a place where he is less likely to hurt himself or get cast if possible. If you keep prescription drugs like muscle relaxants for spasmodic colic in your first aid box use them with extreme caution. Treating a horse incorrectly may cause more harm than good. With colic caused by a twisted or telescoped gut, a speedy diagnosis is imperative. Don’t give your horse anything that may mask symptoms.